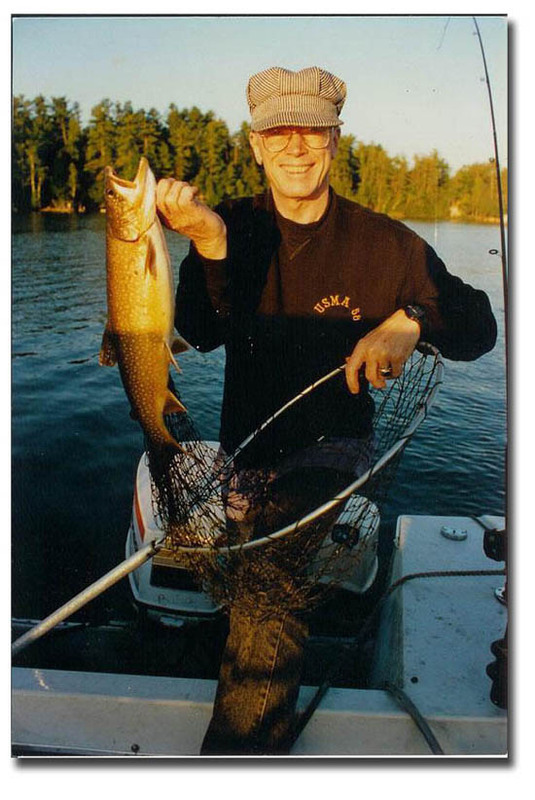 By Dr. Harold C. Lyon, Jr.
Angling in the Smile of the Great Spirit - Six Hundred Years of Wisdom from the Master Anglers of Lake Winnipesaukee. For me it's a great joy to pass on the old secrets and tips I have learned in my years of angling in New Hampshire to my children and grandchildren. It's also satisfying discovering new techniques and learning more about why what we were doing in the old days works today. In my association with an eclectic group of 14 other Master Anglers in my book, Angling in the Smile of the Great Spirit,I am learning that there is no single best way to catch fish. Some troll slow and some fast. Some swear on using certain lures and others catch as many on different lures, depths, and leaders. There is also no clear answer to the question. “Why do you fish?” I have learned many new tricks from these unique men and women, which I am eager to try. Master Anglers, are a species apart. We are a dedicated and driven crew -- indolent, improvident, and quietly mad. And yet, are we only out there to catch fish? No, we go fishing in New Hampshire even after days of catching nothing. Something else is happening when we fish. We have captured some more of what that is on video for a series of DVDs entitled, “A Love Affair with Angling – Glimpses from the Master Anglers of Lake Winni." This all began when we asked the Master Anglers the question, "What is fishing really about? Why do you fish?" The results were frustrating and complex, leading to more questions. Is it about escaping from stress, family, and tensions? Sometimes it is an essential tension release for me and others. Is it some atavistic impulse, which goes back to the primitive hunter-gatherer days where we were imprinted in our genes to go out and catch fresh food for our families? Maybe something like that is part of it, but since so many practice "catch and release," that’s not all that's going on. For Type A fishermen, fishing is a form of competition. These anglers are always striving to catch more, bigger fish than others. One angler here will not reveal any information on the radio. When called, he will quickly respond, "Go to Channel 4" (Channel 4 does not exist on the marine radio) -- a code to a secret channel where he will talk cryptically without giving away any secrets. These men are, perhaps, competitors in all aspects of their lives and this carries over to angling. This helps explain the increasing number of bass tournaments, which are scheduled every weekend of summer on Lake Winni in New Hampshire. Is it a form of ancient therapy, where people fish to have solitude and refresh themselves from the tensions of life? It is partly that, and though this may be closer to what it is than we realize, it is more than that. Is the feeling of a powerful fish struggling for life on the other end of our rod something we become addicted to? I think we can become addicted to angling and that feeling of the life-death struggle is part of what we seek, anticipating the energy of those struggles transmitted up from the fish through the line and our rod, into the muscles and nerves of our hands, arms, shoulders, into our brain where some synapses fire, a pleasure signal to which we become addicted. But there is more than that. Is it an excuse to be immersed in beauty and nature -- to be with our Maker in the beauty of his natural settings? That may be closer than any other explanation I can come up with - hence, the title, Angling in the Smile of the Great Spirit. I found that most of the Master Anglers have not really contemplated this question much, "What is angling about?" But they know they fish every time they have an opportunity and they love doing it. That is enough for them…and for me. We academicians often tend to analyze things to death! Leave it well enough alone and just go fishing. I spent the first thirteen summers of my childhood on this beautiful lake beginning 70 years ago. I then went off with my military family to all the distant places where such families go. That was followed by West Point, seven years as a Ranger, Airborne Army officer, graduate school, and new careers as an educator and psychologist. I always returned to Lake Winni in New Hampshire when I could. I have fished and hunted in many other places throughout the world where the Lake Winni lessons served me well. But in no other place have I found such fulfillment in angling or more beauty in nature. My children and grandchildren are also drawn back to the shores of this beautiful lake. I learned in these travels how difficult it is to learn to fish a large, unknown lake without the benefit of a mentor who knows "the secret spots" and techniques I learned as a child. There are many ideal looking bass spots on this lake where the structure seems perfect, but where, for some reason unknown to me, the bass just don't congregate. Knowing the varied techniques the other Master Anglers and I have shared here can save you years of trial and error frustrations. I recall from boyhood years how the wealthy vacationers with the finest tackle from Abercrombie and Fitch (back then a famous angling store instead of the boutique for the GenXers it has become today), would fish on the Lake and count it as successful if they caught during their vacation what our family caught in a good afternoon! As young anglers, we loved it when they would come over to ask us for help. Fishing seemed to be the one sport which best gratified that innate craving for an intimacy with those forces of which I knew so little." Throughout this series, I refer to "Master Anglers" instead of "THE Master Anglers." This is in no way a slight to the 14 other Master Anglers featured who together have over 600 years of Lake Winnipesaukee, New Hampshire angling experience. There are many other Lake Winni fishermen who could be called “master anglers” that are not featured here and I’ll name a few of them who I have come to know since writing the book. Barbara Cotton; Paul Phillipe; and Al Stewart; Rick Davis; Mario DeCarolis; Chuck French; Jim Warner; Carl Gephardt; Alan Nute; Bill Martel; Jason Parent; Ted St. Onge; Stephen Perry; and Travis Williams and me. Not all “master anglers” want to share their secrets with others, like my mentor, Uncle Gordon, who was very secretive. I selected this group of 15 because of our many years of successful angling, support of other anglers, and a gracious willingness to "pass on" the secrets of success to others. I gave each Master Angler a questionnaire which gathered a short history of their New Hampshire Lake Winni angling, their top five tips for each fish, their favorite stories, and some opinions on such issues as the disappearance of the shad and yellow perch, and the management ideas they would implement if they were in charge. Additionally, each was asked the ubiquitous question, "Why do you fish?" The series of articles that follow contain each one's answers to this questionnaire. I presented them here in this series by age seniority, the oldest first. As unique individuals their responses are different and varied. ...and certainly Gus Pratte, Cal and the Retired Fishing Partners (RFPs) who on fixed incomes team up to save gas and share angling fellowship. … or not catching, as negative reports are not only also helpful and humbling for old anglers and encouraging to novices who quickly learn that they are not the only ones who get skunked!